But to Avi. He recalls arguing with the late Edward Said – and there is a titanic voice to be ever missed, irreplaceable is the only word – over the Oslo agreement. Here is what Avi writes: “In the years since 1993, I have often asked myself: who was right and who was wrong? When things were going well, when progress was being made, when Oslo II was signed, for example, I thought that I was right and that Edward was wrong. One major stumbling block has been hundreds of Hamas political detainees held in Palestinian Authority and Fatah-controlled prisons in the West Bank. (The Palestinian Authority routinely denied such arrests, although Abbas announced that 200 Hamas prisoners would be freed on the occasion of the start of Ramadan.) Hamas also demands that Fatah security forces supplied, trained and supervised by US General Keith Dayton halt their crackdown on resistance fighters from Hamas as part of the American-backed plan for crushing any form of resistance to Israeli occupation. This really is the heart of the matter. Hamas is in effect asking its Fatah/Palestinian Authority (PA) opponent to abandon its primary role undertaken as part of its “peace strategy” and its commitments to the so-called “international community,” the Quartet roadmap, as well as the Dayton plan. 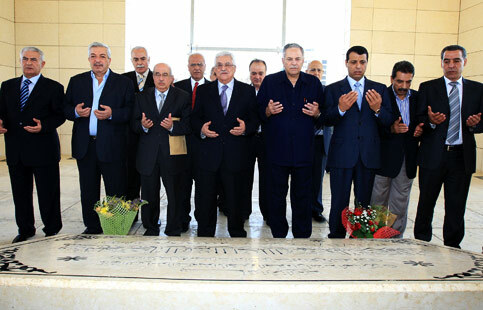 Fatah and the PA apparatus it controls adheres to this US-sponsored anti-resistance strategy as the primary condition for the continuation of international financing for the PA.
Fatah leaders, including some of those newly elected to the Fatah Central Committee, pray next to the tomb of the late Fatah leader and founder Yasser Arafat, 13 August 2009. True, the conference was held on Palestinian soil, but, ironically, under the watchful eye of Israeli soldiers. 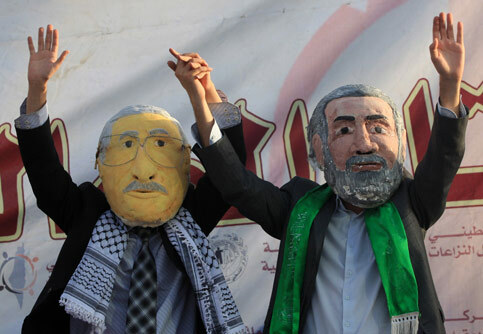 The failure of the Palestinian Liberation Movement (Fatah) to achieve any of its declared goals was symbolized in its holding the conference under occupation. This reflects not only the demise of Fatah — the faction that dominated the Palestine Liberation Organization (PLO) for decades — but the general demise of contemporary Palestinian nationalism. Israel’s prime minister has refused to commit to an independent Palestinian state during talks with Barack Obama, the US president, at the White House. Binyamin Netanyahu told Obama that he wanted the Palestinians to govern themselves, but steered clear of explicitly endorsing the two-state solution set out in the so-called “road map”. As of January 13, only two network evening news stories (NBC Nightly News, 1/8/09, 1/11/09) had even mentioned international law—a mere 3 percent of the total stories that NBC, ABC and CBS’s newscasts had broadcast on the Israeli military offensive since it began. During the videoconference Mashal stressed the necessity of pressuring Israel to put an end to its occupation of the West Bank and its siege on Gaza. He explained that “if we [Palestinians] find another way to end the occupation – we will use it,” but noted that all efforts to seek help from the international community had failed. The Hamas leader stressed the party position that it will recognize Israel when it withdraws to the 1967 borders, and reiterated that any settlement between the sides will necessarily include such a proviso. Yasser Abbas, the son of Palestinian Authority President Mahmoud Abbas, revealed this week that he’s a self-made millionaire who started his own business shortly after the signing of the Oslo Accords.